It all started with two brothers and a simple idea. An idea to build a salon and spa where one could come to look and feel good about themselves while enjoying a relaxed and friendly atmosphere. And so it began - in January of 2000, Felice and Tony initiated the construction of what is known as the "castle" like building on Niagara Street in St. Catharines. The concept the brothers had in mind for this Niagara based structure was an open courtyard, designed to soothe and take you into their culture for just a few hours. A retreat where one could not only indulge in beauty or unwind from a stressful day, but also be assured a staff with the highest technical skill and creativity of the trade. Valvano is truly dedicated to the industry and foremost it's client. This is why in 2005, the Valvano brothers launched the release of their own brand of hair care. With the already saturated market for professional hair care, this was a huge endeavor and risk for Felice and Tony, but one that was essential for placing this company on the hairdressing map. The development of each product was inspired by Valvano's clients. The key was to put together a line of product to help your hair look and feel the best that it can. Valvano had the opportunity to work hand in hand with chemists to ensure the best quality and selected ingredients went into every formula. There are currently over 30 creations ranging from shampoos, conditioners, treatments, styling and finishing products. Valvano is innovatively working with their clients needs to create new products to add to the line. Valvano Salon Spa opened it's doors August 1st, 2000 with a mission to be the greatest (not the biggest) company in the world. That is, to be completely dedicated to the clients and friends that walk through it's doors. 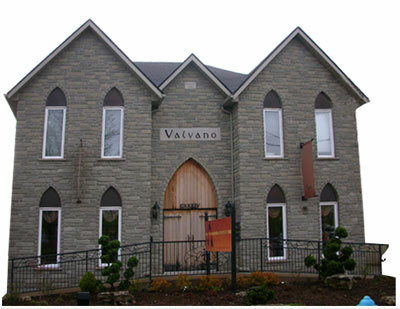 Not only has Valvano been recognized for its numerous awards in the hair industry, and it's involvement with educating our youth and Ontario's cosmetology programs, Valvano has also very honourably been acknowledged for it's business achievements. Through the Business Link of Niagara, Valvano Salon Spa was awarded for all that it has done to give back to the community - an award Felice and Tony are most proud of to date!! Things have very easily come full circle for Valvano - as it is not hard to give back to a community who has supported us along the way! !